Essen, situated in Germany's North Rhine Westphalia State, is most often associated with the Ruhr industrial region - whose coal mines and steelworks powered German expansion in the late nineteenth and twentieth centuries. Until the late 1980s it was Germany’s fifth largest city with a population peaking at around 730,000 people. However, a decline in heavy industry has led to a dramatic change in the profile of this most interesting of cities. The best places to stay in Essen are perfect for exploring its diverse charms. Today, Essen is still an important regional centre. It remains the headquarters of many of Germany’s largest corporations - industry in Essen is definitely not dead! There has been something of a transformation, though, with it currently boasting a thriving ‘tertiary’ sector around services and information. The massive mining complex at Zeche Zollverein is the city’s most famous landmark. It's now a prestigious UNESCO world heritage site - notable for its classic Bauhaus design and dubbed ‘the most beautiful coal mine in the world’. The city has of course made the most out of this, with it being home to multiple design centres and museums. To the south of the city are the boroughs of Kettwig and Werden. These towns have been absorbed into the larger city, and yet still retain their unique historical character. The Essen Minster and Treasury, which date back to the time of Otto the Great, have the most special historic artworks - the most precious of which, the ‘Golden Madonna of Essen’ (c.980), is the oldest known sculpture of the Madonna. The Villa Hugel (built in 1873) was the 269-room mansion of the industrialist Krupp family. It was a spectacular and enormous family home - complete with its own train station! It now hosts concerts and high-profile exhibitions. You can also visit the Aalto Theatre (1988) or the Saalbau, home to the Essen Philharmonic Orchestra. If you're looking for a fun family day out there are the botanical gardens at Grugapark or Lake Baldeney to the south of the city. The city is busy year-round with both leisure and business travellers. So if you want to ensure a room in one of the best places to stay in Essen, don't leave it till the last minute to book. 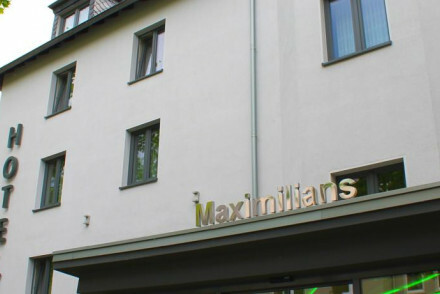 Hotel Maximilians is a modern ‘no frills’ hotel in the centre of Essen. The rooms are light and comfortable. And everything is on the doorstep. Hotel Waldhaus Lagenbrahm is a four-star rated hotel in a quiet area close to the centre of town. The rooms are light and airy with French windows. A great base for exploring the city. Georges Hotel is a smart town house in the trendy Ruttenscheid district, featuring designer rooms with deluxe bathrooms and opulent decor. Great restaurants within minutes - a grown up spot for enjoying the city. 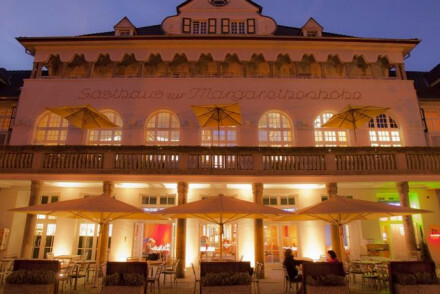 Mintrops Stadt Margarethenhohe is an elegant hotel just outside the centre of the city. It prioritises simplicity and comfort, making it a perfect bolthole. Schlosshotel Hugenpoet offers luxury and romance within reach of Essen, and surrounded by beautiful parkland. The rooms are sumptuous and traditional in style, you'll also find a gourmet restaurant and historic wine cellar. A must for foodies and romantics. Landhotel Burgaltendorf is another luxurious stay outside the city proper. It offers contemporary rooms and is set amid lovely gardens. There are good facilities if you're travelling with kids in tow and a spa for some pampering too. Weather-wise, the best time to visit is during the summer months - with the average temperature climbing to 18°C in July and August. International visitors should fly into Düsseldorf Airport, located 30km southwest, before taking the train to Essen. Or, you could always rent a car and drive into the city. If this is your preferred option, check out the selection available with our partner, Rentalcars. Widen the net to include our picks of the best places to stay in Düsseldorf or all our recommendations in North Rhine Westphalia. A contemporary, no thrills hotel offset from Essen city centre. Hotel Maximilians' rooms are light and spacious with a focus on comfort rather than extravagant decoration. With a convenient underground service into the centre, its a great choice for a city break in Essen. A good value option. 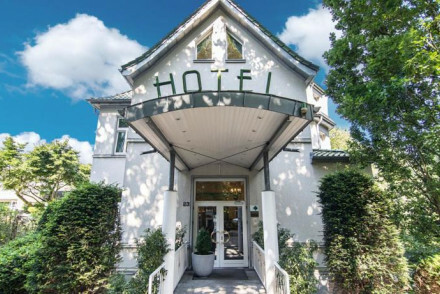 Value chic - A reasonably priced, stylish and contemporary hotel occupying two townhouses, in Essen's Rüttenscheid district. Sights nearby - For a relaxing daytrip head to the nearby the Grugapark Therme thermal baths. A four star property situated in a quiet leafy part of the city. Simply designed rooms are light and airy with large french windows and clean design. Indulgent breakfasts are served in the dining room or on the summer terrace. A peaceful base for city exploring. Local exploring - Well located with easy access to Essen's sights and recreational facilities. Sights nearby - Visit the 11th century dome in the centre of the city. A chic and charming townhouse in Essen’s trendy Rüttenscheid district. Plush designer rooms with luxe bathtubs and rich furnishings. An excellent breakfast is served in house, and you're within five minutes of several fantastic restaurants. A grown up spot from which to explore the city. Local exploring - Located right in the heart of Essen's hippest neighbourhood, this is a great base for exploring the city. 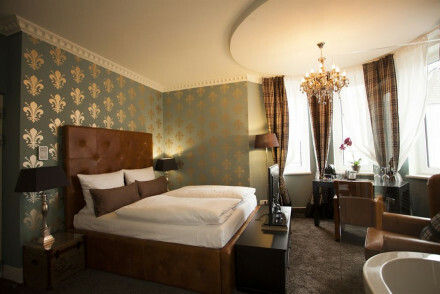 Value chic - Great value considering the comfortable and stylish rooms, central location and excellent service. Sights nearby - The nearby Cathedral of Essen cannot be missed. Simple, smart hotel outside Essen's city centre. With modern and spacious rooms, Mintrops Stadt Hotel prioritises simplicity and comfort. Those with a penchant for industrial history will enjoy the nearby Zollverein Coal Mine museum. A perfect bolthole for exploring the city. Local exploring - A spacious and modern hotel, just off the old market square of Margarethenhoehe, perfect for exploring this historic area. Great walks - Explore the old market square of historic Margarethenhoehe.